Avast ya scallywags! Drop anchor and prepare to be boarded. There be Lil’ Pirates in these waters! 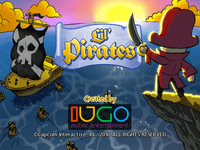 Amass your perfect crew and craft the finest ship as you set sail for adventure and plunder as the captain of your own pirate vessel. From a modest beginning you’ll transform your ship into an object of fear and envy and amass a fortune fit for a king.